Yet another fabulous venue invited The Man Bird and I to sample their dinner menu; Breadsall Priory – and this really is a fabulous venue, I’m not just saying that. The Priory itself dates back to the 13th Century and part of this original structure still stands in some of the “Priory rooms” that guests can stay at in what is Marriott Hotels’ oldest hotel in the world. 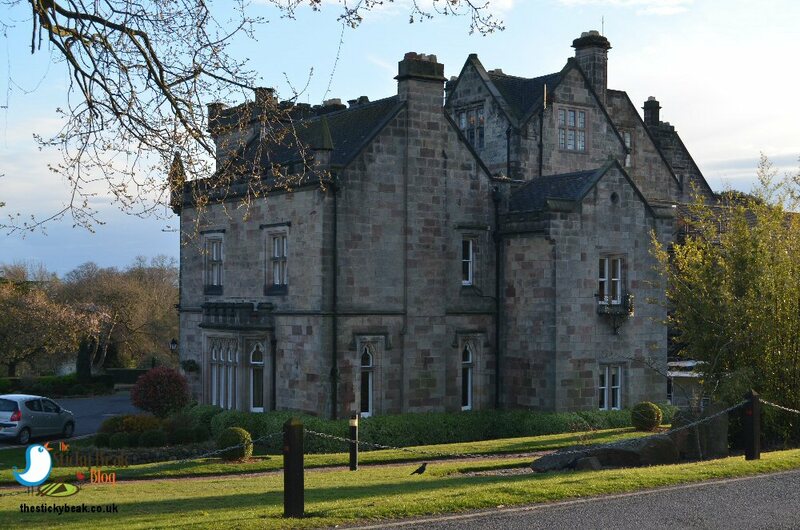 I won’t go into all the finer details about the venue, you can head to their website for that, but Breadsall Priory also boasts a pair of 18-hole golf courses, a Spa, heated indoor pool, and fully equipped gym! There’s ample parking and we walked the short distance from the car park to the main reception, where a lovely member of staff gave us directions to Cast Iron Bar and Grill. It’s a fair old walk, which is hardly surprising given the dimensions of the priory; still, on the plus side, you work up an appetite and can justify the extra calories (at least 1000, I reckon!) that you’ve used. Cast Iron Bar and Grill is a multi-level venue and our table was located at the back, down a small set of stairs; this meant we had a little more privacy and it was quieter too. 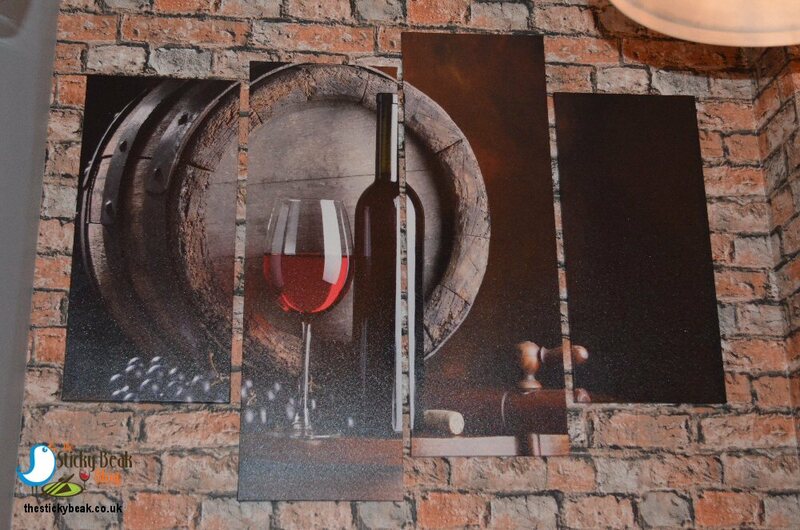 A lot of thought has gone into the decor and I liked the exposed red-brick style wallpaper on the main wall, it looks very realistic. Dove Grey tone paint blends really nicely with the warm brick paper, both on the wall and on the lower level panelling. A splash of red livens things up a smidge from its location on the banquette seating, and the sturdy wood tables have deep brown, padded chairs at them too. As you would expect, the tables were set fairly simply and classically with heavy silver-toned cutlery, thick white cloth napkins, and weighty glassware. Single tealights twinkled softly in their plain glass holders, complimenting the subtle light fittings on the walls. 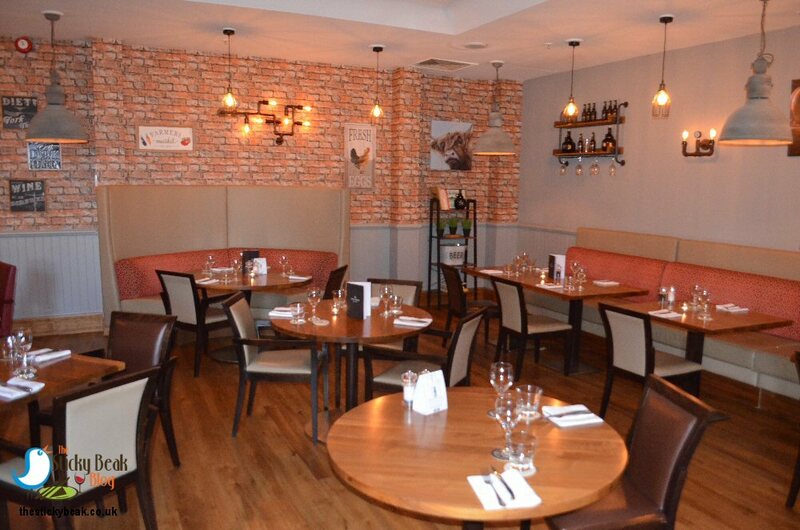 We had a choice of eating from the set menu, offering 2 courses or 3 courses for £21 or £25 per person respectively (Monday-Sunday from 6.30pm), or from the a la carte selection. Purely for the subject of the blog, we chose from the a la carte, but the prix fixe options were fantastic too. 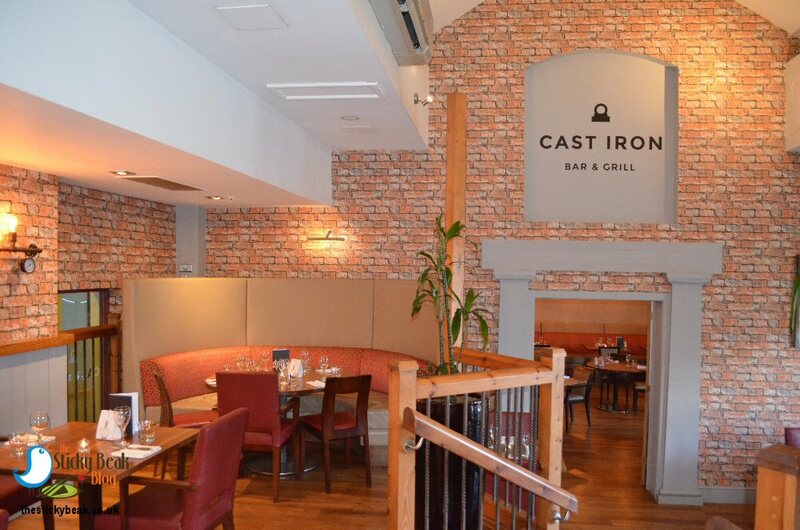 Cast Iron Bar and Grill also do a lunchtime prix fixe menu Monday-Saturday Noon-2pm priced at £12.95 or £15.95 for either 2 or 3 courses. Our lovely server for the evening was a young gentleman named Baz, and he looked most dapper in his monochrome uniform. Baz quickly got us sorted out with some water for the table and a bottle of Chenin Blanc, the house white wine – and a very fruity number it is too. For starters we chose Pea and Shallot Tortolloni with Spinach, Pea Purée, and Basil oil (mine), and Caramelised Scallops, Celeriac, and Cumbrian Ham (The Man). My Tortolloni had been carefully arranged with a moat of verdant Pea purée that had dark green dots of Basil oil interspersed within it. 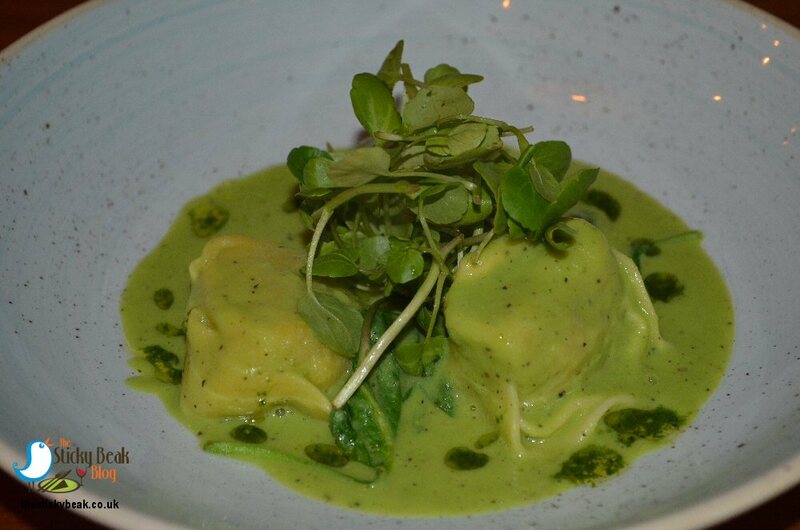 A trio of pastel green coloured pasta parcels (no doubt due to the Spinach content) had been cooked perfectly al dente, and their finely textured vegetable filling was delicately sweet on the palate. The intensely fragrant Basil oil really zipped in the mouth, and the wilted Spinach leaves had provided a little bed for each Tortolloni parcel. 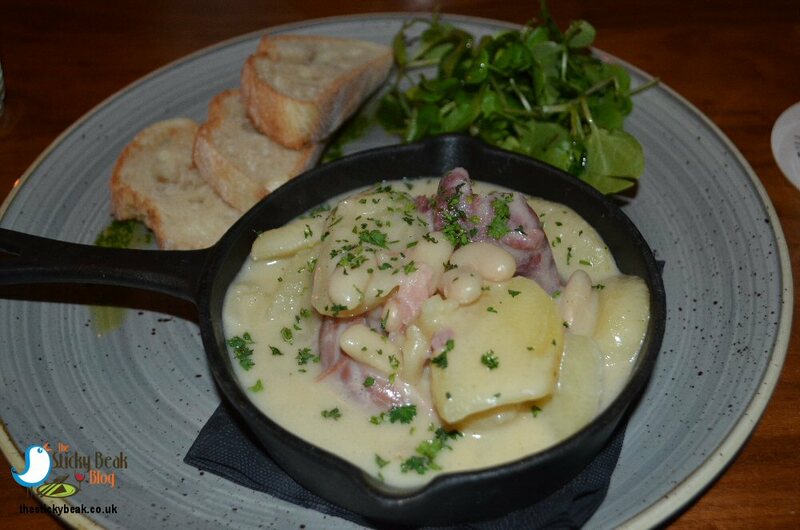 This was a superb, light starter that I would recommend to anyone. The Man Birds’ Scallops had a beautiful, golden caramelised surface which yielded a whisper-light crunch when bitten into. Chef had expertly cooked them to retain their silkiness and gentle perfume; the flesh was perfectly soft-yet-firm and melted on the tongue. 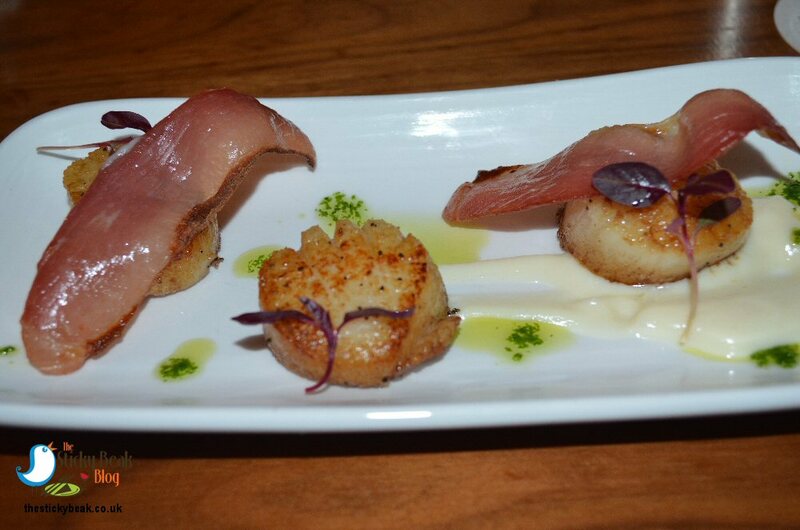 The Cumbrian Ham was sliced paper-thin and had a wonderful salty edge to it, which contrasted brilliantly with the sweet Scallops. Velvety Celeriac purée was delightful on the tongue and His Nibs loved its gentle earthiness. Micro herbs provided an artful garnish as well as a splash of colour. 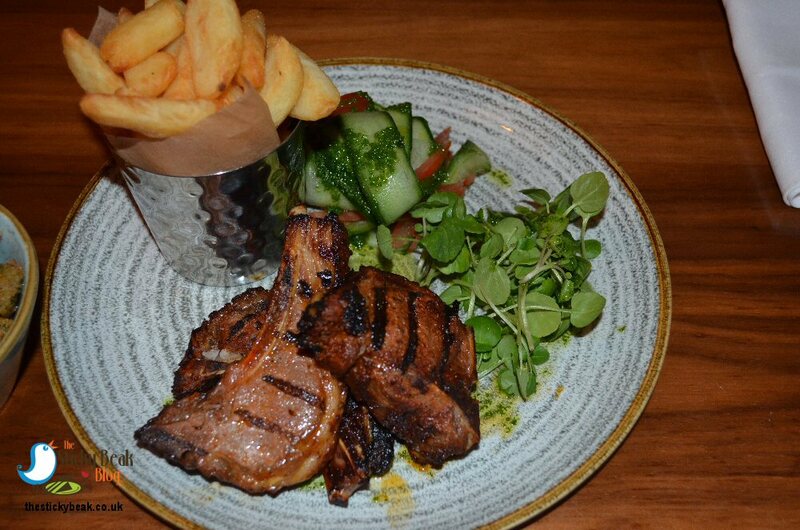 My main course, Tandoori Lamb Cutlets, had come from the grill section of the menu, and all the dishes here come with Cast Iron butter, Chips, and Watercress. The trio of cutlets were rich in taste and tender-as-you-like; the Tandoori coating was thickened nicely and there was enough of it to discern the spices, but not so much that it was running off the Lamb. This delicious spicy but creamy dish was served with a salad of Cucumber ribbons, Tomato slices and plenty of Coriander. The young Watercress leaves gave a superb peppery note to the dish, which was very satiating but not heavy on the tummy. 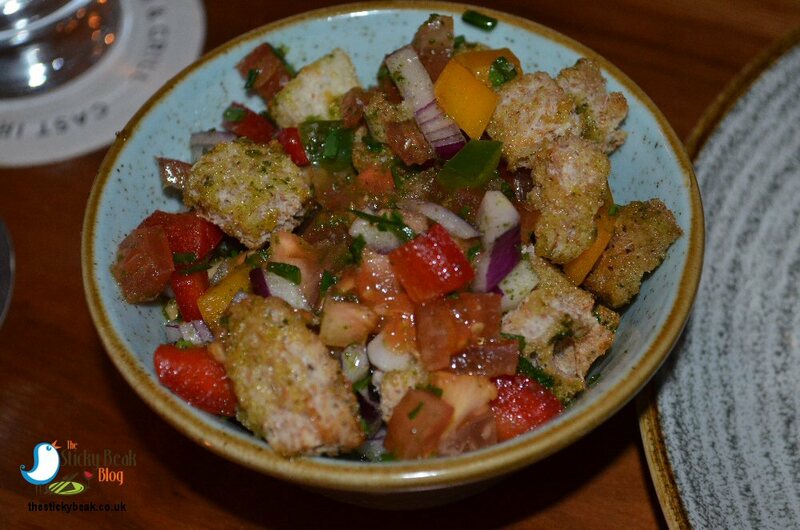 I had ordered Panzanella salad to go with my main course and this peasant style salad is vastly under-rated in my humble opinion. Some people turn their noses up at the use of stale bread, but when combined with Tomatoes, Red Onion, and mixed Peppers, and soaked in oil, this dish is actually really tasty and versatile. Personally, I loved the fruity extra virgin Olive oil used in Cast Iron Bar and Grill’s version and Chef had used fresh herbs in abundance to really brighten the flavour up. 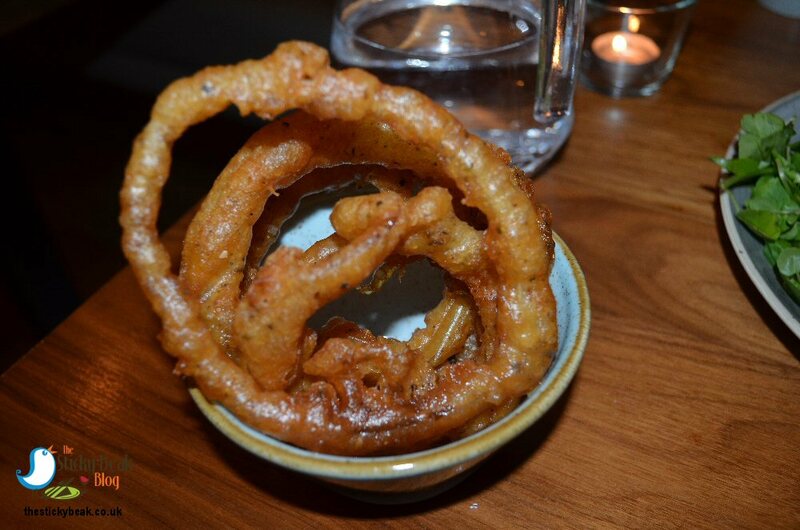 Onion Rings come in many guises and The Boy Wonder loves them all, so when he spied a Sage-batter variety on the menu he ordered a portion in double jig time. You could see flecks of Sage within the batter, and when bitten into you got the merest hint of the herb - which was gorgeous. It wasn’t the lightest batter in terms of texture, but it wasn’t at all greasy and it was other-worldly crisp and crunchy. The onions themselves were nice and soft, mild, and deliciously sweet tasting; they slipped down jolly nicely and soon none remained. Pudding posed a little problem for His Nibs; there was Sticky Toffee Pudding, but the build-your-own Ice Cream Sundae had piqued his interest. After a bit of umming and aahing, the decision was made – Ice Cream Sundae it was! 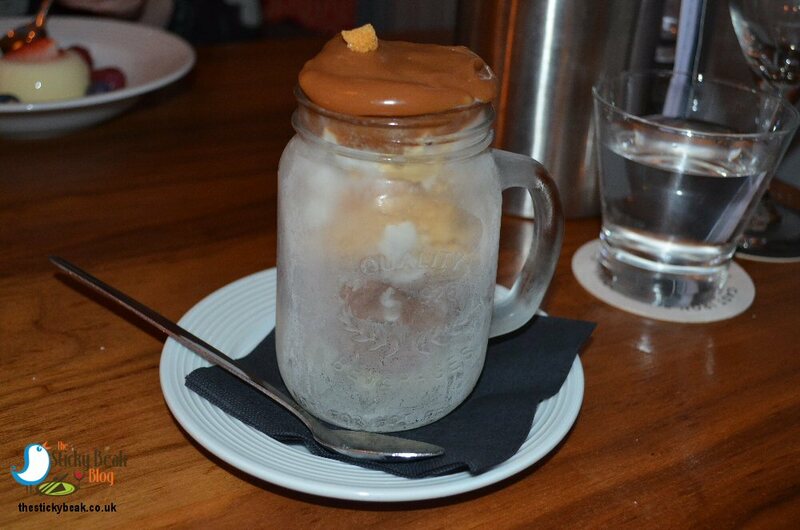 Never one to do things by halves, The Man ordered Vanilla, Caramel, and Chocolate Ice creams, topped with Honeycomb and Meringue pieces, and crowned with Toffee sauce. That sounds like a bit of a belly buster, and when it arrived in the frosted, chilled glass it was every bit as massive as we’d anticipated. If Carlsberg did desserts......! This morsel was just beyond anything you could wish for; temptation incarnate, if you will. Cast Iron Bar and Grill use Jude’s Ice Cream and it’s beautifully rich and creamy, but more importantly the flavours actually taste deeply of what they’re supposed to. You can’t accuse the Cast Iron Bar and Grill kitchens of being stingy; there was loads of Honeycomb and Meringue to crunch away at. The Toffee sauce was mind-blowingly rich and wonderfully thick in consistency – this was a proper, bona fide spoon-sticking sauce, none of that thin pourable stuff here. His Nibs was determined to get every last miniscule bit of the sauce into his tummy, however long it was going to take! What was the clever bit about this pudding? The frozen glass, that’s what. Thanks to the cold temperature, all the ice cream was kept nice and solid - not a runny, dribbly bit anywhere in sight, even at the end. I had chosen the White Chocolate Panna Cotta with Raspberries for my dessert and I wasn’t disappointed when it arrived, it looked so beautiful; a snowy dome surrounded by pretty, colourful fruits. 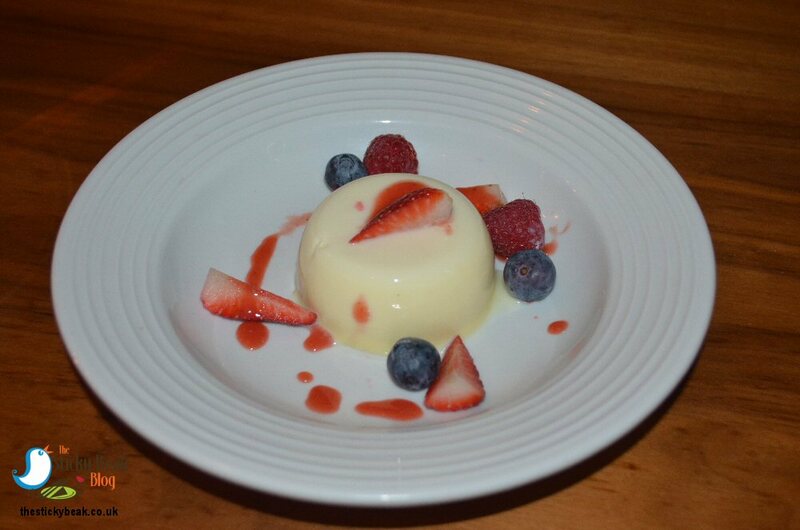 It really was a Panna Cotta made with White Chocolate; you could clearly taste the flavour and creaminess of the choccy. There was no subtlety at all in this regard and thank goodness for its brashness is what I say! This was simply sublime...ad infinitum. I loved the contrast between the creamy White Chocolate and the vibrant Raspberries, Strawberries and Blueberries that were arranged around the platter. 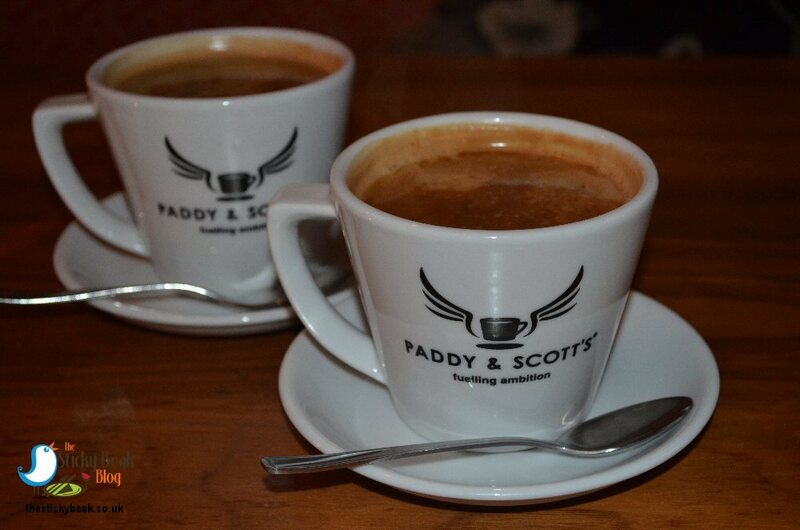 We partook of our usual black coffees; Paddy and Scott’s coffee, according to the large cups they came in. This was a lovely end to the meal and the coffee was a medium roast, so not too strong or jarring on the palate. Baz and the rest of the team at Breadsall Priory’s Cast Iron Bar and Grill had been wonderful all evening. Nothing had been too much trouble and they’d taken pains to check at each course that we were enjoying our food. Hot Wings definitely given, and very well deserved they are too!